Apple is getting into the credit card business. The company has announced a virtual payment card built into the wallet app on iPhones. Apple Card sports a number of features aimed at helping consumers lead a healthier financial life. "With our hardware, software and services, we think that Apple is uniquely positioned to make the most significant change in the credit card experience in 50 years," Apple CEO Tim Cook told the audience at an event held Monday at the Steve Jobs Theater in Cupertino, California. As it has done in the past, Apple aims to revolutionize an existing product. In this case, it aims to make the credit card more consumer friendly by simplifying the application process, eliminating fees, encouraging customers to pay less interest, and providing a new level of privacy and security. Customers can sign up for an Apple Card inside the wallet app on their iPhone and start shopping with it in minutes. The card is tightly integrated with a number of views that give a cardholder real-time information about their balances and latest transactions. Transactions are linked automatically to Apple Maps, with merchant names and locations displayed. Purchases are automatically totaled and sorted into color-coded categories -- food and drinks, shopping, entertainment and such. Weekly and monthly spending summaries are provided in the card app. Meanwhile, solving any problems a cardholder may encounter is just a text message away. "It's a very slick design for presenting information to the consumer," said David Robertson, publisher of The Nilson Report, a newsletter on the card and mobile payment industry, based in Carpinteria, California. Apple Card, slated for availability this summer, includes a cash rewards program. Consumers receive 1 percent for outside Apple Pay purchases, 2 percent for Apple Pay purchases, and 3 percent for purchases from Apple. The rewards are added as cash to at the end of each day, and can be used to pay the card or make more purchases, or be sent to family and friends. Apple has eschewed typical credit card fees, such as annual membership fees, late payment fees, fees for making international purchases, and fees for exceeding a card's spending limit. It will not boost the interest rate on the card when a payment is made late. The card app provides guidance on making payments. It shows a cardholder a range of payment options and calculates the interest on those options in real time. It also makes suggestions about using payment frequency to reduce interest payments. 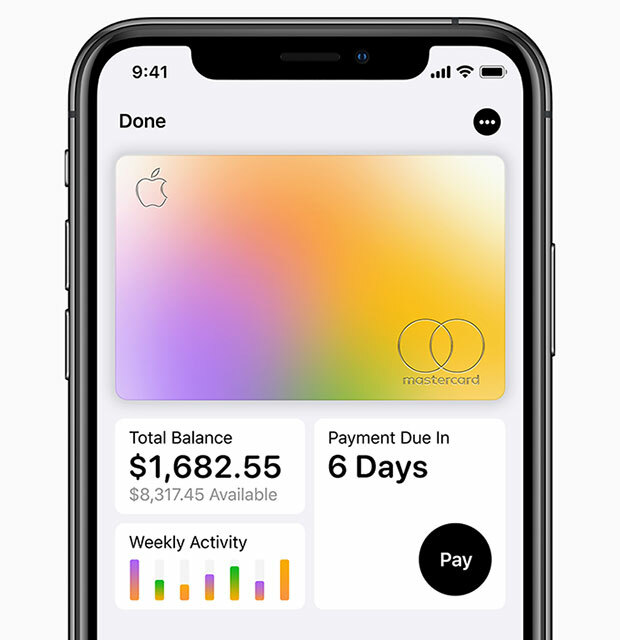 Apple Card is backed by Goldman Sachs and Mastercard, and Apple says its goal is to have interest rates that are among the lowest in the industry. "We also designed Apple Card to set a new level for privacy and security," Apple Vice President for Apple Pay Jennifer Bailey said at Monday's event. "Security is totally integrated throughout the hardware and software." 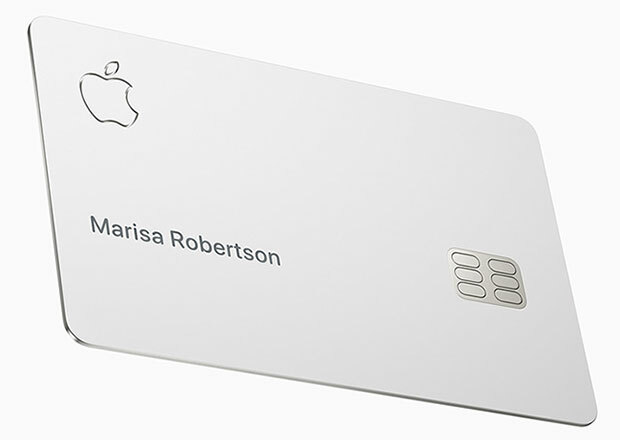 As part of the security scheme, each Apple Card has a unique card number that is stored in the "Secure Element" of an iPhone. The Secure Element is a special chip used to keep Apple Pay transactions secure. Every purchase made with Apple Card is authorized by a biometric authenticator -- either a fingerprint through Touch ID or facial recognition through Face ID -- and a one-time unique code that constantly changes. What's more, the security and privacy architecture of the card protects information about what cardholders bought, where they made their purchases, and how much they paid for them -- even from Apple. "This card has ironclad privacy behind it," remarked Tim Bajarin, president of Creative Strategies, a technology advisory firm in Campbell, California. Privacy is also part of the physical credit card issued to Apple Card cardholders. The titanium card contains no card number, CVV security code, expiration date or signature. "I like what they've done with the physical credit card," said Jim Miller, vice president for the banking and credit card practice atJ.D. Power, a data, analytics, and consumer intelligence company headquartered in Costa Mesa, California. "I think that's going to become the industry standard," he told TechNewsWorld. "You don't need the risk of some waiter writing down your credit card information in a back room." "The titanium card is exquisitely designed, really good looking," Nilson's Robertson told TechNewsWorld. "It will be something that makes a statement when you have to use it at the point of sale instead of Apple Pay. That ability to make you feel special, or be noted, is something Apple's first to market with," he pointed out. "A heavy titanium card that only has your name on it makes you the star, not the bank." The card's shine may be dulled, however, by the 1 percent Daily Cash received when it's used. "Right now, that 1 percent is an Achilles' heel, because 1 percent is lower than what you'd be getting from other providers," Robertson said. "I'd recommend leaving the titanium card at home and carry another card that gets you 2 percent cash back for those times you can't use Apple Pay," J.D. Powers' Miller suggested, "but a lot of people are going to want to carry the card because it's different." Apple Card has the potential to boost the usage and acceptance of Apple Pay because of the 2 percent daily cash back feature, Creative Strategies' Bajarin told TechNewsWorld. "Apple customers will react very favorably, and it could even draw non-Apple customers over to the Apple platform," he added. However, it's doubtful the card will grow Apple Pay, in Robertson's view. "Anybody who wants to pay with Apple Pay is already doing that, so it's not going to create new Apple Pay users," he said. "It's really a market share play. Existing credit card issuers will lose transactions to Apple." Apple Card looks like the most attractive credit card on the market at the moment, but it won't always be that way, predicted Rob Enderle, principal analyst at the Enderle Group, an advisory services firm in Bend, Oregon. "When a card launches, it often launches with very aggressive terms that change once they get to a critical mass of users," he told TechNewsWorld. "I'd expect other cards to counter much of Apple Card's terms shortly. I also expect, since Apple is a high-margin company, that these very aggressive terms will expire in a year or so. Until then, it is an extremely attractive offering," Enderle said. "Consumers are going to love this until the terms are adjusted to increase Apple's margins," he added, "and they find they are locked into the card because of the new debt they have accumulated."